I see Joseph’s hand on Mary’s shoulder. I see the Child breastfeeding. Mary is tired, she just had a baby; exhaustion and satisfaction in her face. I see the midwives, on their hands there is blood. I see the baby angels, the old lady angels, the 13 year old angels, the red headed ones, the white headed ones. I see the tears on some of their faces. 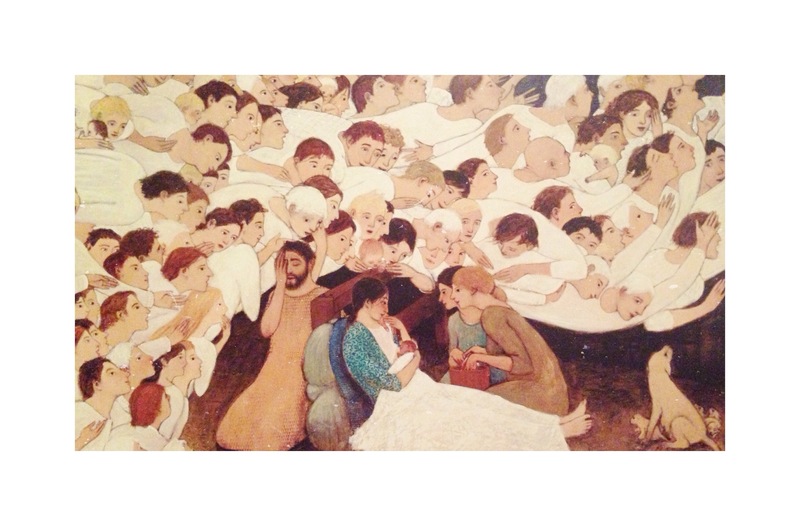 The angels are rushing to see the Child, and rushing to share the hallelujah. I see everything in this painting. I see the faith of the mother, the faith of the midwives, the faith of Joseph. I also see my faith. This is how I envision the Christ-Child’s birth. The hand of a lover, exhaustion and satisfaction from the mother, midwives, angels. Foreseen and unforeseen, all attend. I was filling out the form to change my last name. It gave me the option to change my first name too. This option led me to wonder: what if I changed my first name, what would it be, what is the significance of my names? I have always loved names. I collect them, like a stamp collector collects stamps. I file them away, categorizing them: aliases if I were an author, names for a spunky heroine, names for my future sons & daughter. My name is Sofia. Sofia means “wisdom”. My middle name is my great grandmother’s maiden name. It is also similar to the Spanish word for “red” (my Mom’s favorite color). I am blessed with a second middle name, Fe. I am named Fe because my parents exercised faith that I may be healthy, because they had so little money. What’s in a name? There are little stories in mine. I am blessed because of the gifts my parents gave me when they named me. I have wisdom, family and faith in my name.